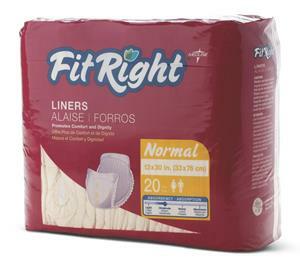 They all have a 4D-Core® with odor protection for super absorbency; cloth-like backsheet for increased comfort and discretion; and low profile core for improved comfort and fit. The FitRight® Restore® Super liner (FITLINER500) has a layer of Medline Remedy® Skin Repair Cream laid into the brief to nourish and soothe fragile skin. Both the FitRight Restore Super liner and the FitRight Plus liner (FITLINER300) feature soft anti-leak guards to help reduce leakage and improve containment.